Have you ever observed a flock of birds flying in the sky? They tend to make a V formation, which is very efficient for many reasons that can be better explained on a physics page or other sources. The birds at the front break the wind and as they flap their wings, they create a flow that in short, makes it easier for the other birds, which literally “take a ride”. One more interesting fact is that there is no constant leader. They swap positions, so the guys at the front can rest. They all take their turn. Think about this in the context of a family. Sometimes, the mum takes the lead, carrying and pushing everybody around. If there is balance, the father would then take over relieving the mum, so she can “take a ride” for a while. As the kids grow, they should also take part on the flying game to help the parents ease their load. A single parent would struggle as it would be harder to find a “buddy” who can take the lead as they rest their wings. Many will keep flying, afraid of asking for help. They will fly until their wings break! This will also apply in all other areas of our life! See, we are not meant to fly alone! Some human birds believe it is about flying faster and higher. 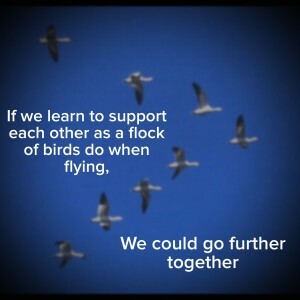 They believe it is a competition, not realising that we need each other and as we support one another, we are actually able to fly further together! Others don’t want to take their turn at flapping their wings, slowing the flock down. Should we start looking around to see if anyone needs our help, or stop being afraid of asking for support when needed? We might just be able to fly further together and make this a better world for all to live in! Please leave a comment, Do you ask for help? Are you flying together? Can you see how loved you are? By nearly dying, she saved my life! You can subscribe using the Contact us page. Onita, did you find the Contact us page? I simply want to tell you that I’m very new to blogging and truly savored this web-site. Almost certainly I’m planning to bookmark your website . You definitely have good article content. Thanks a bunch for revealing your webpage. Outstanding post but I was wanting to know if you could write a litte more on this subject? I’d be very thankful if you could elaborate a little bit further. Kudos!